Jennifer Hello, my name is Jennifer, I'm 28 and I live in the Inland Empire of Southern California! 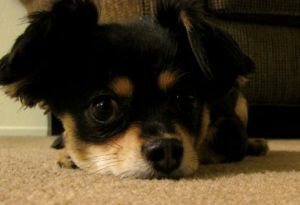 I am single, no kids, but I do have a cute little Chihuahua/Pomeranian mix named Mr. Brown. Jennifer Well for years I've always wanted to go to the "other" POD, it was always in the back of my head. Then one day in 2008 I decided to just do it! I did just a little research on which POD I wanted to join, but honestly it all came down to the look and feel of Zazzle that made me choose it over the other one. Zazzle immediately screamed Web 2.0 - sleek, modern, and clean. I'm a sucker for a well designed website. I tried it out and everything was incredibly simple to understand, hardly any fuss, I was hooked. Jennifer I do! I'm almost embarrassed to share them because they are in progress, but what the hay! Designs by Nyxxie - This is my main store. I didn't want "nyxxie" to be the title of my shop, just my user name, but I worked with it and now it's "Designs By Nyxxie." You can find a variety of cute and funny designs. My designs are clean, colorful and fun! Cute as Kawaii - I have a lot of Kawaii themed products in my main store so I opened this one up to start adding more Kawaii designs to it. For those that don't know what Kawaii means it's simply just "cute" in Japanese. Nyxxie's Math Boutique - This store isn't open yet, but if you go the url you can still find the products in Zazzle's marketplace. Basically it's just a bunch of designs featuring multiplication tables. My goal is to create more math products. You're Invited! - I began making a lot of invitations so I figured if I keep going at this route it will be too congested in my main store, so I made a new store! It simply has invitations for different occasions including birthdays, baby showers, wedding, bridal shower, general parties, etc. Jennifer It's hard to say because invitations sell differently than regular items. definitely this "Mmm, Cupcakes" apron. Jennifer Well I'm a creative at heart, so when I'm not being creative on Zazzle I'm being creative somewhere else. Aside from Zazzle I'm a logo designer, so I keep busy with that. I also love photography, cooking/baking, and every once in a while, when I can settle myself down, I love to write. I have a soft spot for poetry and I love watching action/thriller flicks. And of course, I enjoy being with family and friends. Jennifer Zazzle comes last in my life. Whatever extra time I have I devote it to Zazzle. But it really comes down to how much I can commit myself to it. I'm also self diagnosed ADD, so if I can't make myself focus on Zazzle then my attention will go somewhere else. Jennifer About a year. I've been at Zazzle for almost two years now. When I first joined Zazzle I didn't put my heart into it at all. Let me give you some real honesty. I joined Zazzle in September 2008. My first check cleared in May 2009. This is because I had barely any products. And I barely put in any time. I remember around July/August 2009 I got real with myself and decided that I wanted to succeed with Zazzle. So I started making Halloween and other products feverishly and everything I was making was selling like hotcakes. By the end of 2009 I was a ProSeller. The ProSeller Corner Getting noticed and becoming a ProSeller takes a lot of hard work and time.What advice would you give to those aspiring to become a ProSeller? Jennifer My little story above proves that hard work pays off. So definitely keep pushing yourself to do better. I know that there are a lot of people out there with an extraordinary amount of talent, that are working hard but haven't reached ProSeller status yet. Just know that if you keep doing what you're doing it will pay off in the end. I find that taking a break and coming back with a fresh start really helps. And the Zazzle forums continue to be a great amount of help for me, I am still learning. Take all advice and implement everything. Mr. Brown is so cute! He should be on some Zazzle products. :) I also really love your math store idea. I know you will do very well with it.